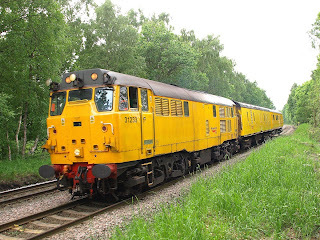 Network Rail's 31233 is seen in Hardwick Woods returning to Derby with her test train this evening. Nice to find the loco at the front for a change ! This Type 2 locomotive was originally built at Brush Loughborough with a Mirrlees 1600hp engine, and delivered to British Rail in October 1960 (according to the allocation notes), as number D5660, where it spent 27 years on the Eastern Region based at depots such as Stratford, Finsbury Park, March, Thornaby and Immingham etc. In 1987 it was transferred to Bescot, and was named "Severn Valley Railway" in 1993 at Crewe. Stored at Old Oak Common in 2002 it was finally rescued by Network Rail to serve on their track testing trains. Nice one there, 31s have made quite a return this week! The shape of things to come ?